You may have seen my review lately of the Milton Combi Steriliser, If you havnt seen it yet you can check it out here ... Milton Combi Steriliser REVIEW! 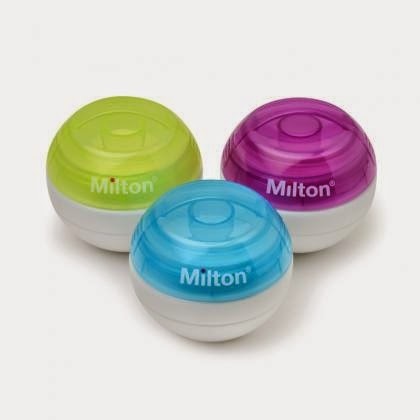 Well the lovely people from Milton have given me 3 Milton mini soother sterilisers to giveaway!! The Milton mini soother steriliser is easy to use you simple make up the soloution using the milton mini sterilising tablets ahead of time then when you need to sterilise a dummy you simply unscrew the lid pop it inside wait 15 minutes and you have a lovely sterile dummy! Would you like to win one for yourself in a choice of 3 colours Green, Blue or Pink? Well simply enter using the rafflecopter form below. 3 winners will be chosen and contacted at the end of the giveaway! The giveaway will end at 12AM on wednesday 16th July 2014. The 3 winners will be picked using rafflecopter and contacted via email. Open to UK residents only. Blue please as it just the thing for my friend. Purple. For my cousin who has just had a little girl. For boyfriend's niece, in pink. Thanks for the comp and GL to all! my bf is due in 3 weeks eek! I love the blue.I would like it for my daughter who's pregnant and is due in August. Would love a purple one for my lil niece. I'd give the green one to a pregnant woman who visits my workplace.